This DienesFloors.com blog will keep you up to date on all the latest hardwood floor tips, products and services available. Subscribe here and you won't miss a thing! As part of our hardwood floor refinishing services, Dienes Floor Sanding & Refinishing uses the highest quality of stains and finishes. Continue reading "Hardwood Floor Refinishing Services"
When installing a hardwood floor, it is important to consider the types of wood and wood species that will give you the look that you want for your room. At Dienes, our wood floor services include new hardwood floors, old floors, custom inlays, installation, refinishing, restoration and more. 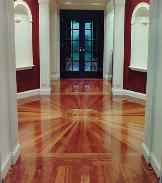 Continue reading "Wood Floor Services"
Why stop at the foot of the stairs? We can extend the beauty of your wood floors into your staircase with our wood stair installation services. Continue reading "Wood Stair Installation Services"
Dienes Floor Sanding & Refinishing provides a variety of custom and special services and wood floor repairs. Continue reading "Special Services for Hardwood Floors near Cleveland Ohio"